SUMMARY: Not eating can cause bad breath just as much as gorging on an onion and garlic sandwich. We all remember going to grandma's house. At various times through the year, you and your family would pile into the car and make the trip. Upon arrival, you'd enter a house full of savory smells and even more delicious treats. All grandma ever needed was one look at you to declare: "My word, you must eat something dearie!" Maybe this is a stereotypical portrayal. Point is, bad breath was less likely at grandma's house. Most of us hear only about the foods we shouldn't eat to avoid bad breath. Onions and garlic are often used as examples of what not to eat during a date. However, we're far less likely to be told that eating no food can also lead to bad breath. Dry mouth is one of the four common causes of bad breath. As the mouth dries, bacteria production increases - paving the way for an embarrassing flub of bad breath. The Cleveland Clinic stated that chewing was an effective method to rapidly promote saliva within the mouth. Chewing sends many subconscious messages to the body, telling it that you are eating and that it needs to prepare. The added saliva is the first stage of helping to break down food and allow easier passage through the esophagus. However, not all foods were created equal, at least as far as bad breath is concerned. If you're trying to get rid of halitosis, don't feed your hunger with foods that are heavily processed. Cake, cookies, ice cream and candy may all taste delicious but they'll encourage more bacteria growth than you want. Ditto for the infamous onions and garlic. The best answer for a hungry stomach are foods that are rich in fiber. Fruits, vegetables and legumes all contain high counts of this dietary material. The Mayo Clinic stated that one cup of split peas alone contained over 16 grams. If you're not much of a herbivore then spaghetti and whole-wheat bread can also help. Worst comes to worst, drink some water. The added moisture will reduce bacteria growth rate. 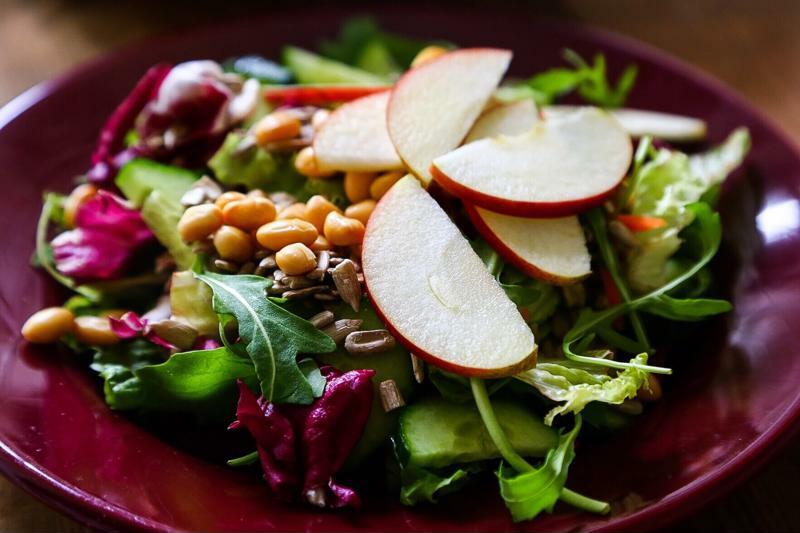 A nutrient loaded salad is an excellent way to stay healthy and fight bad breath. Some cases of bad breath are stubbornly strong and require extra help. Remember, you want a product that either adds moisture or stimulates saliva development. For the former, TheraBreath provides a variety of oral rinses. Our TheraBreath Oral Rinse provides oxygenation to help hinder bacteria growth. It comes in mint and icy mint flavors to help leave your mouth with a cool feel. You don't have to eat a cheeseburger to stimulate saliva growth, otherwise no diets would ever work. Simple foods like gum and even lozenges can help. The TheraBreath Dry Mouth Lozenges have a flavor agent that stimulates saliva while fighting bacteria with zinc, oxygen and xylitol. Of course, we have gum too.